We need you to be a part of THE SOLUTION. Industrial logging is having devastating impacts on the health, quality of life and sustainable development of communities across the South. Dirty extractive industries put profit over the health and prosperity of the people. They promise economic development and community care, but instead deliver low-paying jobs, environmental disasters and health consequences that reverberate for decades. Passing an anti-biomass resolution, ordinance or moratorium in your city or county will send a strong message to industry executives and policymakers that we stand united in demanding a clean and sustainable future. GET STARTED. ORGANIZE IN YOUR COMMUNITY. DOWNLOAD THE COMMUNITY TOOLKIT. This toolkit provides a framework for passing an anti-biomass resolution or ordinance. Each community is unique and will require differing and creative strategies and approaches. The people of Richmond County North Carolina are already suffering the impacts of environmental injustice from dirty industries. Now they are fighting back against an Enviva wood pellet plant that would be built in their community. A community in eastern North Carolina opposes the construction of an Enviva wood pellet facility in their neighborhood. Residents living near Enviva’s wood pellet facility in Garysburg, North Carolina, speak about the disruptive impact of the plant on their community. The dirty biomass industry is not the future for our Southern communities or forests. We need long-term solutions that value the health and prosperity of people and the environment. 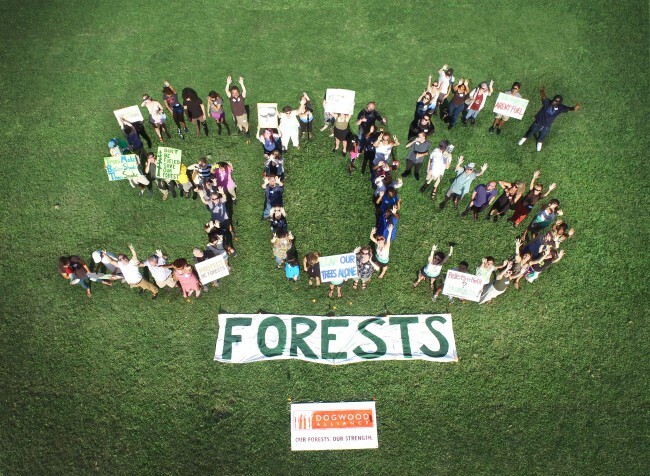 With organizing and action, we can pave the way for a future that puts the needs of the people before corporate profit and values our forests for the life-supporting services they provide just by standing. Our Southern communities and forests are not resources that can be taken advantage of for the personal gain of greedy industries. They are vital components of a vibrant global community and ecosystem, and we must take action to make sure they continue on. Start organizing in your community today. Community members form a giant human SOS banner in Savannah, Georgia.